The natural decomposition of municipal solid waste results in the production of landfill gas. This gas consists primarily of methane and carbon dioxide. Methane is a very potent greenhouse gas which is a key contributor to global climate change, over 21 times more potent than carbon dioxide. Methane also has a short, 10-year, atmospheric life. Because methane is both potent and short-lived, reducing methane emissions from municipal solid waste landfills, the second largest source of methane in the United States, is one of the best ways to achieve a near-term beneficial impact in mitigating global climate change. Because of its high methane content, landfill gas is both potentially explosive at high levels and also a valuable energy resource. Landfill gas can be used as the fuel for numerous energy projects including electric generation, direct use in boilers, steam generation, and leachate/condensate evaporation. The EPA's New Source Performance Standards (NSPS) require most large landfills to collect and destroy landfill gas. Cogeneration Consultants offers the Landfill Owner a proven solution and the chance to turn the liability of collecting landfill gas into an asset by developing a successful landfill gas to energy project. Landfill gas to energy projects have also been proven to provide opportunities for positive community relations for the landfill owner with the addition of a "green power" project. When you work with Cogeneration Consultants you have one contact for all aspects of a project, from the preliminary site work to the designing, construction, management and commissioning. Cogeneration Consultants has the in-house capability to provide all Program Management, Design, Engineering, Construction and Administrative services necessary to offer a complete turnkey package. Experience and qualified in numerous Landfill Gas Projects. Staff has been providing landfill services for over fifteen (15) years. Experienced, in-house capabilities produce a quality plant that is cost effective and proven in reliability. It is estimated that a landfill gas to energy project can capture a large percentage of the methane emitted from the landfill. The gas is collected and conveyed using a system of vertical wells, horizontal piping and a positive displacement blower to convey the landfill gas to energy facility. 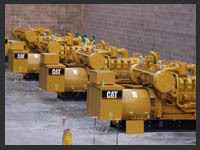 Before the landfill gas is combusted in the generator sets it is processed to remove the particulates and water by dehydrating (cooling) the gas and removing contaminants which will harm the engines. After the landfill gas is cleaned up it is delivered to the engines where the captured methane is destroyed, converted to water and a much less potent carbon dioxide, and produces electricity and heat. Utilizing methane to produce electricity displaces fossil fuels and avoids carbon dioxide that otherwise would have been released. 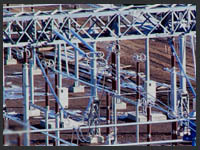 The electricity is sold to the grid except for a small portion which is used for facility operations. Cogeneration Consultants specializes in the recovery of methane gas from landfills for the purpose of creating profitable and environmental benefits by utilizing the landfill gas as an alternative energy source. Methane, a potent greenhouse gas, is a key contributor to global warming. Rather than flaring the gas to the atmosphere, Cogeneration Consultants utilizes the gas to produce electricity. Cogeneration Consultants has also utilized the waste heat generated from jacket water and engineexhaust to provide steam for thermal loads. Cogeneration Consultants currently has designed, constructed and commissioned 15 plants in six states, producing over 55 megawatts of capacity. This experience covers landfill gas electric generating facilities and direct gas sales projects using landfill gas to fuel industrial processes. Reducing methane emissions from MSW landfills is one of the best ways to achieve a near-term beneficial impact in mitigating global climate change. The United States Environmental Protection Agency estimates that a LFG project will capture roughly 60-90% of the methane emitted from the landfill, depending on system design and effectiveness. 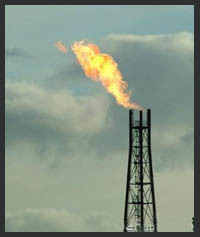 The captured methane is destroyed (converted to water and the much less potent carbon dioxide) when the gas is burned to produce electricity. Utilizing methane to produce electricity displaces fossil fuels and avoids carbon dioxide that otherwise would have been released. Landfill gas to energy projects destroy methane, a potent heat trapping gas and offset the use of non-renewable resources such as coal, natural gas and oil. According to the United States Environmental Protection Agency a typical three (3) megawatt project operating in 2008 will be equal to one of the following: reducing annual greenhouse gas emissions from 23,600 passenger vehicles, offsetting the use of 670 railroad cars full of coal, or offsetting the carbon dioxide emissions from 14.6 million gallons of gasoline. Landfill gas to energy projects also help reduce local air pollution and create jobs. The amount and type of gas created by a landfill depends on the amount of garbage buried in the landfill, the age of the landfill, the size and depth of the landfill and the chemical environment inside the landfill but a typical landfill has enough gas to power 7,200 homes per year.